People everywhere usually want to be liked and popular. In today’s age, with so many things being highlighted through social networks like facebook and twitter, young adults and children are being pulled in so many directions. Learning how to deal with peer pressure is an essential skill to succeed in today’s world. Martha, a B.A. 2nd semester student does some research for us on its effects and provides suggestions to overcome peer pressure. Peers are people who are part of the same social group. So the term ‘peer pressure’ refers to the influence that peers can have on each other. Peer pressure is the feeling when someone forces you to get involved into something you are not willing to do. It can be both a positive and negative influence. Peer pressure is not always a bad thing; sometimes a friend’s influence can be a good thing, because they might, for instance, stop you from doing something stupid that you’ll regret later. Thousands of decisions are made between friends everyday, and they influence each other’s choice and behaviour. This often shows the tendency of human nature to listen and learn from people in the same age group. Just as an iron knife can sharpen the dull age of a battered knife, fellowship with good friends who have a mature and healthy attitude can sharpen one’s personality, helping him become a better person and promote a sense of unity. Friends influence our lives in many ways, though we may not realize it. Friends who are good in studies and indulge in other healthy activities encourage and stimulate interests in others to be like them. Good peers increase confidence and a sense of security because one knows that they can understand what is going on in our lives and help to work out the problem together. They also inspire one to the new and exciting things that one might not have thought of. But there is also a dark side to peer pressure. Young people are susceptible to peer pressure because they want to be liked and fit in. Some common issues faced by them are need for status, fear of losing friends, attention, search for identity, need for support or approval and constant worry that friends might make fun of them. The idea that “everyone’s doing it, so why not me” can influence one to leave better judgment or common sense behind. 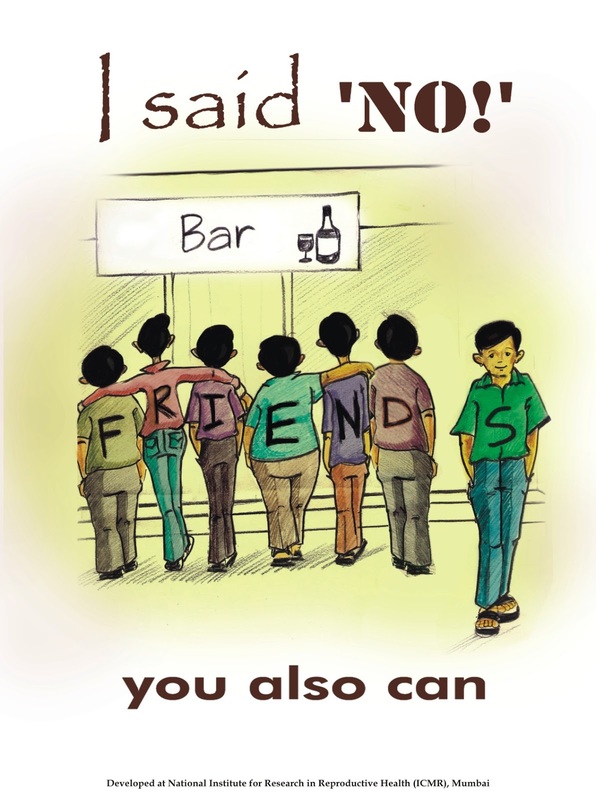 Peers can influence friends to involve in other risky habits such as smoking, drinking, drugs, partying too much or bunking class. The fact that adolescents become particularly vulnerable to peer pressure is because they find their friends more understanding and comfortable than their parents. 1. Value Common Interest: Try and hang out with people who like doing similar things like you, then you are less likely to be pressured to do things that you don’t want to do. Hanging out with the so called “cool group” may not be as much fun as it looks. 2. Say No: If you don’t have the habit of saying NO to something, you should know that sticking up for what you believe in feels really good. There comes a time when one must take a stand that may not be popular but right. 3. Try not to judge others: Respecting someone else’s choice may help them respect yours. People don’t have to agree on everything and an understanding of this will make both parties less defensive about their choices. 5. Set goals: Many people don’t have any goal and that is why their lives are without direction and meaningless. Set goals in life so as to avoid unnecessary wrong decisions. 6. Change your mindset: Your peers occupy a major part of your lives and your thoughts and actions are controlled and influenced by them according to their views about you. Peer pressure is just a phase so one should try to reason out things and be determined, and firm in one’s own decisions. 7. Choose your friends wisely: Friendship is important to everyone and it depends on the individual to choose good friends over bad ones. Both will influence you either in a positive or negative way. One should choose to be in the company of good friends to develop healthy habits. 8. Be yourself: Be content with who you are and have strong principles. The key is to resist negative pressure and take control of your life. In this way, you will gain others’ respect. Avoiding peer pressure will also help you stay fit by avoiding what may otherwise ruin your health and attitude. If you willingly submit to negative pressure, fully aware that it is bad yourself, you also lose the respect of others. Not to forget, the tension this will create between you and your parents. Of course, no matter how skilled you are at managing peer pressure, there are some situations where pressure from other people can get out of hand. If you have ever been in a situation where you felt threatened or pressured into submitting to anything uncomfortable, you need to share this with someone reliable. As a student myself, I know the effects of peer pressure, so when it becomes too much to handle, please do not hesitate to tell a family member, a friend from outside the situation, a teacher or a counselor.